NCAA bracket name ideas: What are the most popular bracket names? NCAA bracket names are way more boring (but way less sexist) than fantasy sports team names. 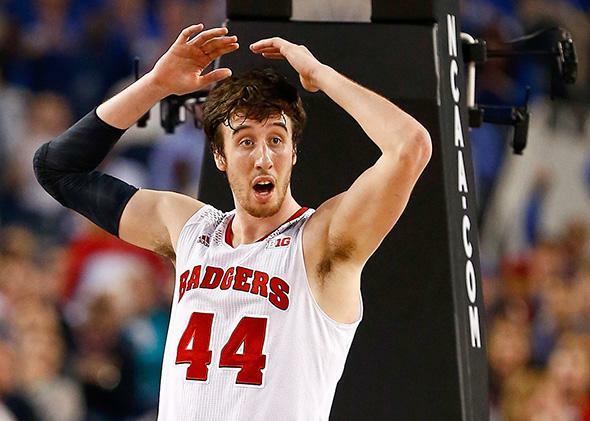 Frank Kaminsky, aka Frank the Tank. Over the next few days, millions of Americans will fill out their March Madness brackets with a high probability of failure. It’s nothing to be ashamed of, though, as college basketball’s huge single elimination setup paves the way for difficult-to-predict upsets that can spoil even the most knowledgeable college hoops fan’s picks. But there is one element that even an amateur game picker should be able to nail with just a few minutes of work: the bracket name. The thing about the NCAA tournament is that most bracket pickers clearly don’t take those few minutes. America’s top NCAA tournament bracket names sound like they were created to be easy to find in a file cabinet. Rodney Ruxin, these bracket pickers are not. Compare, for example, NCAA bracketologists to their more original counterparts in fantasy sports. When I’ve analyzed fantasy sports leagues in the past, I’ve found that participants often have creative souls and a penchant for puns. “Turn Down for Watt” was among the top names in fantasy football last season, “Grand Theft Rondo” was a top name in NBA fantasy games, and “Moves like Jagr” was a top choice for the less popular fantasy hockey. But in addition to the playful puns, there’s a darker side to fantasy sports naming: Many of the top names include various levels of sexism, ranging from “jokes” about domestic violence like “Beats by Ray” (the second most popular fantasy football name last year), to the less awful but still uncomfortable “Rose Before Hoes” (No. 2 in NBA fantasy) and “Bros Before Hossas” (No. 3 in NHL). In NCAA brackets you won’t find nearly as many fun names like “Better Call Gasol” (No. 30 in the NBA), but you also won’t find potentially offensive names like “Semin Stains” (No. 1 in the NHL). On occasion, people do have fun with their NCAA bracket names. The line of what qualifies as a play on words is hard to define, but below are the 10 most common names that I’ve deemed to have at least an element of creativity to them. I still had to browse far down the list to get these. In the NCAA tournament these “fun names” made up just 0.3 percent of all names. In fantasy football, the top 10 “creative” names accounted for 1.3 percent of names in the sample, more than four times as many as the NCAA. The top NCAA name, “Full Metal Bracket,” was used in eight out of all 156,200 brackets while fantasy football’s most popular name, “Show Me Your TDs,” was common across 756 teams in a sample of 360,000. The difference is not because of a more diverse range of names, or because I was harsh on what qualified as “creative.” More than 75 percent of all bracket pickers left their bracket name the same as their ESPN username. Perhaps people are so eager to fill out their bracket after Selection Sunday that they leave their user name as the default. MarinerBaseball1, for example, is not an acceptable name for a college basketball bracket. That said, there are probably a couple of other explanations for why NCAA bracketologists are not only less creative than their fantasy sport counterparts, but also less trashy. First, there are way more NCAA bracket pickers (an estimated 40 million Americans) than there are participants in fantasy football, which is the most popular fantasy sport (an estimated 33 million players). The NFL is also more widely popular than NCAA basketball, which means in sheer numbers there are likely more fans with a greater knowledge of the game of pro football than of college hoops. A more knowledgeable base of fans filling out a smaller pool of players in fantasy sports makes for more pun potential than a larger group that probably contains more casual fans who haven’t followed all the ups and downs of NCAA basketball in a given season. Still, it would be fun if more NCAA tournament entrants attempted some kind of clever pun or movie reference with their team names. You might not win your pool by coming up with a creative name but at least you’ll have made life a little bit sunnier for everybody else. And if you improve on the creativity in 2016, this rundown will be much more fun next season. Until then, the “I Hate Christian Slateners” wish you the best of luck.